When Wave® Petunias were introduced in 1995, they helped change the way gardeners grow petunias. These were not your grandma’s old-fashioned pentunias that required constant care. Fast forward to today, Wave Petunias continue to expand its palette with three new designer varieties. History: The Wave petunia quickly became a favorite among gardeners after its launch in 1995 because of its easy-care maintenance and vivid color. The Wave family has expanded to include five series. Wave Petunia, Ball Horticultural Co. The original Wave series features a low-growing habit, spreading up to 4 feet for ground-hugging carpets of color. Easy Wave series has a more mounded and controlled spreading habit, making it the most versatile and ideal for baskets and containers. Shock Wave series’ petite blooms offer high-voltage color for small spaces. Double Wave® series gives gardeners frilly flowers for baskets and planters. 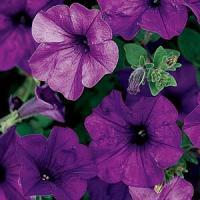 Tidal Wave® series is the most vigorous as it spreads and grows into a flower-filled petunia hedge. Today: The Wave Petunia even has its own fan club, WaveFan Club, with more than 17,000 members at wave-rave.com. In addition to giving Wave enthusiasts a virtual place to share their tips and success stories, the Wave Fan Club offers benefits like VIP contests and helpful hints for gardening success. Fans also can share ideas, comments and photos via the Wave Petunias fan page on Facebook, and follow the Wave series on Twitter @WavePetunias.